Maps Chapter 6, Section 3. 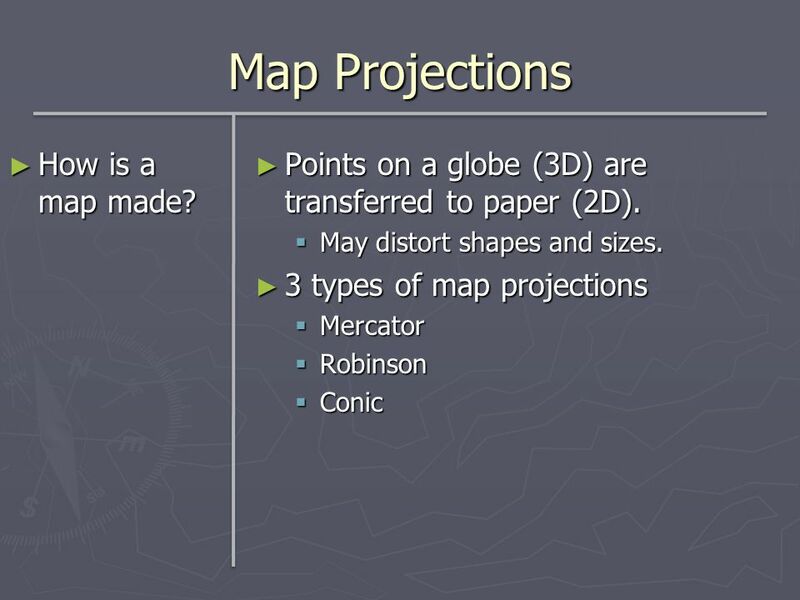 2 Map Projections How is a map made? 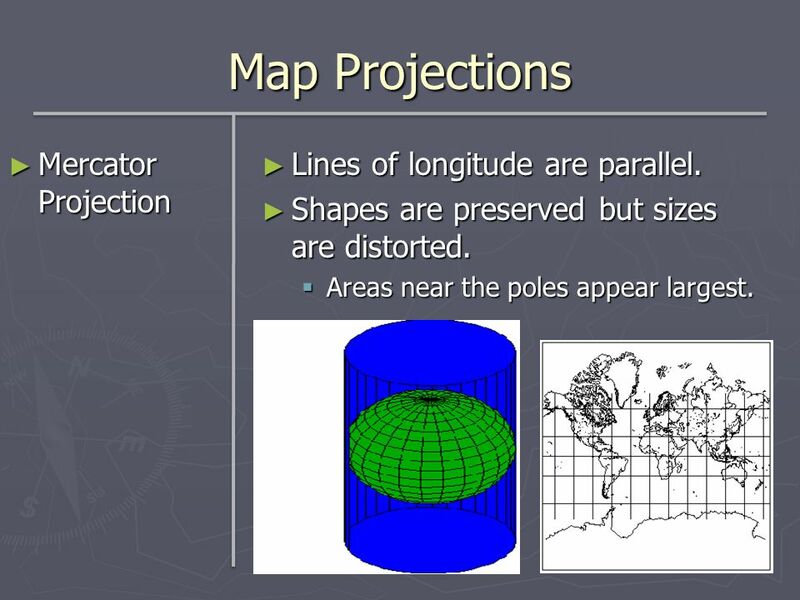 3 Map Projections Mercator Projection Lines of longitude are parallel. Shapes are preserved but sizes are distorted. Areas near the poles appear largest. 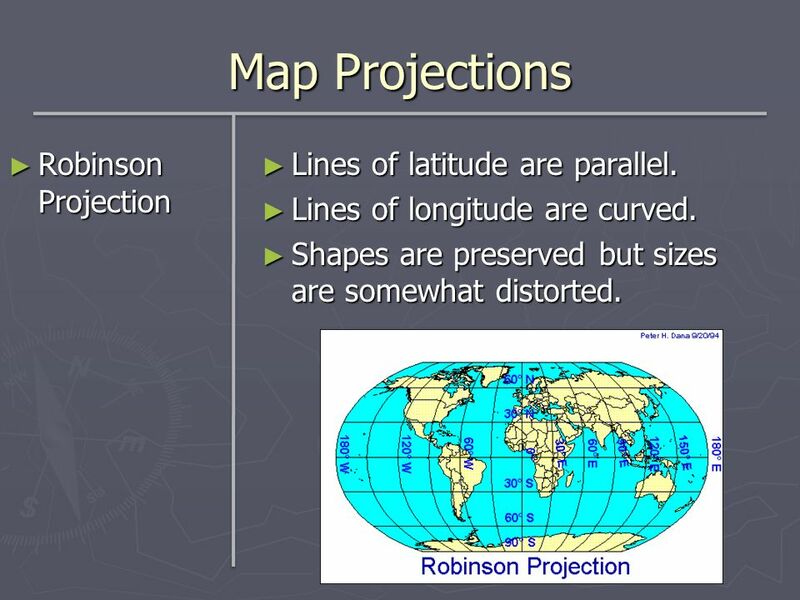 4 Map Projections Robinson Projection Lines of latitude are parallel. Lines of longitude are curved. Shapes are preserved but sizes are somewhat distorted. Made by projecting points from a globe onto a cone. Useful for mapping small areas in the middle latitudes. 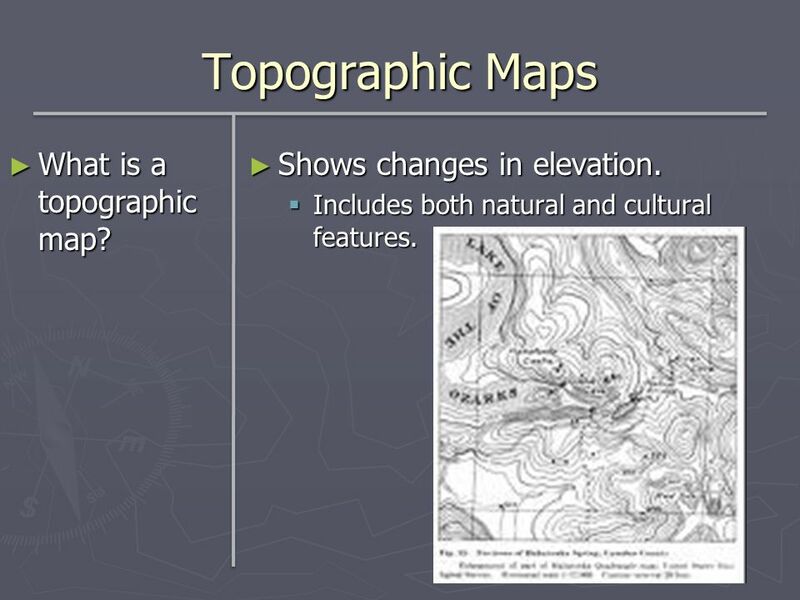 6 Topographic Maps What is a topographic map? Shows changes in elevation. Includes both natural and cultural features. Connect points of equal elevations. Contour Interval Change in elevation between two contour lines. 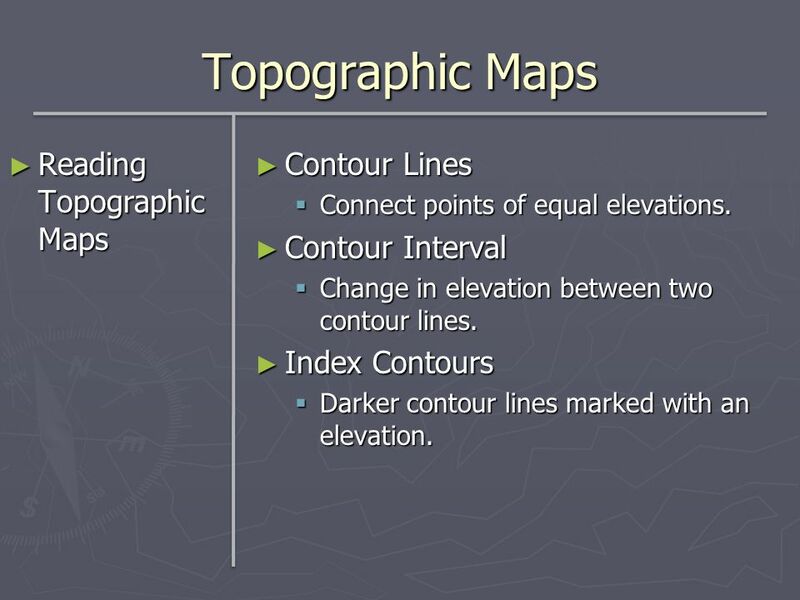 Index Contours Darker contour lines marked with an elevation. 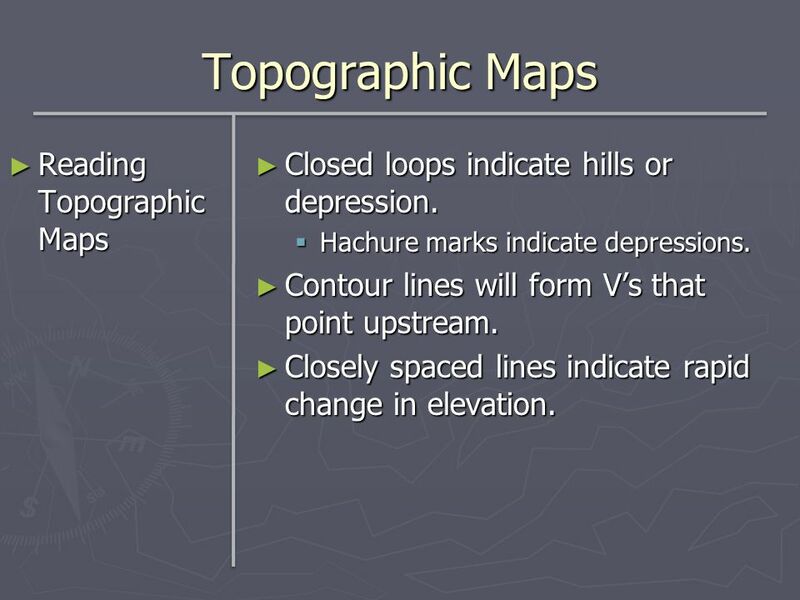 Closed loops indicate hills or depression. Hachure marks indicate depressions. Contour lines will form V’s that point upstream. Closely spaced lines indicate rapid change in elevation. 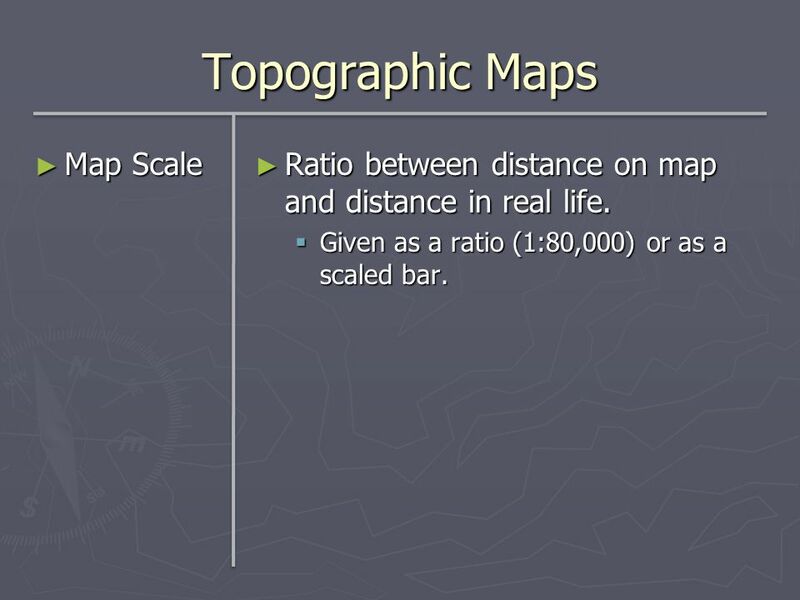 Ratio between distance on map and distance in real life. Given as a ratio (1:80,000) or as a scaled bar. 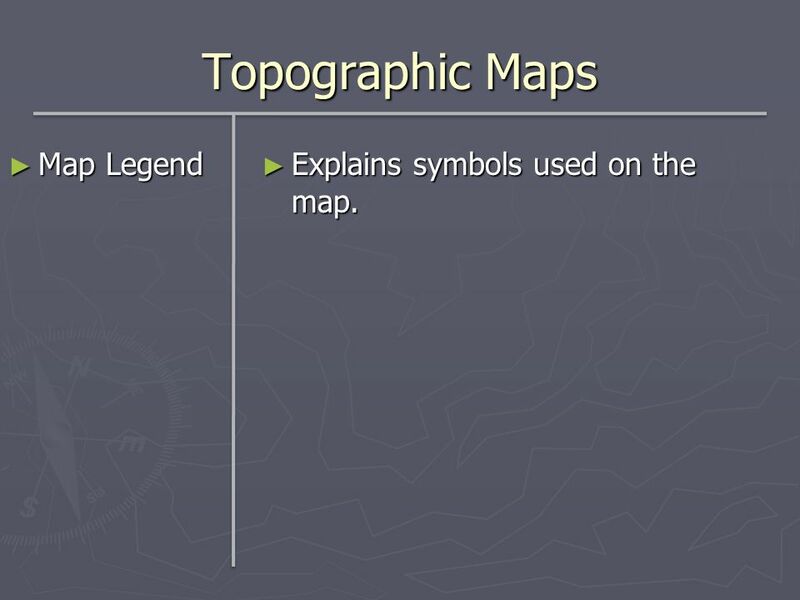 10 Topographic Maps Map Legend Explains symbols used on the map. Maps with the same dimension of latitude and longitude. 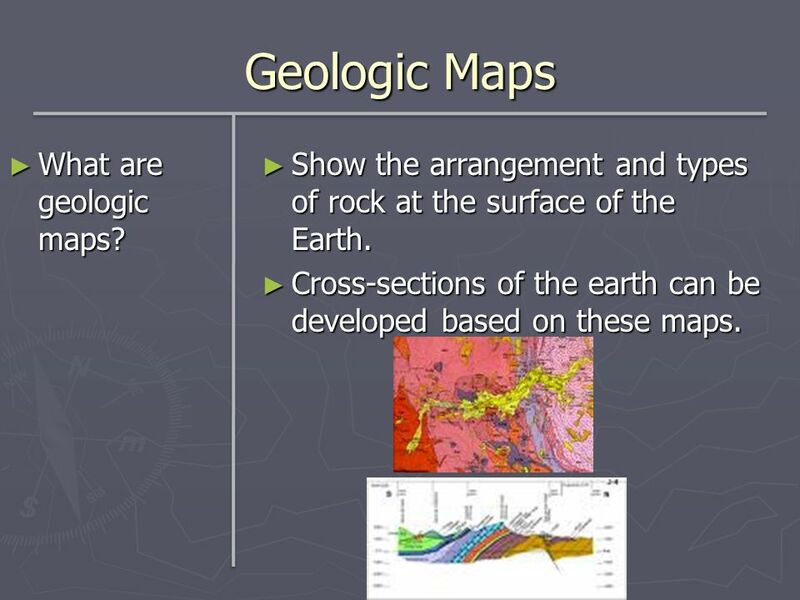 12 Geologic Maps What are geologic maps? Show the arrangement and types of rock at the surface of the Earth. Cross-sections of the earth can be developed based on these maps. 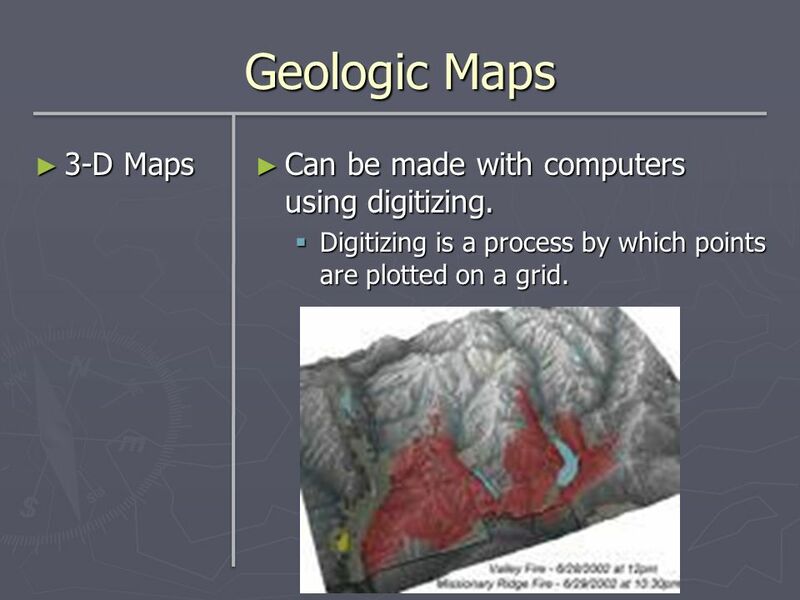 13 Geologic Maps 3-D Maps Can be made with computers using digitizing. Digitizing is a process by which points are plotted on a grid. 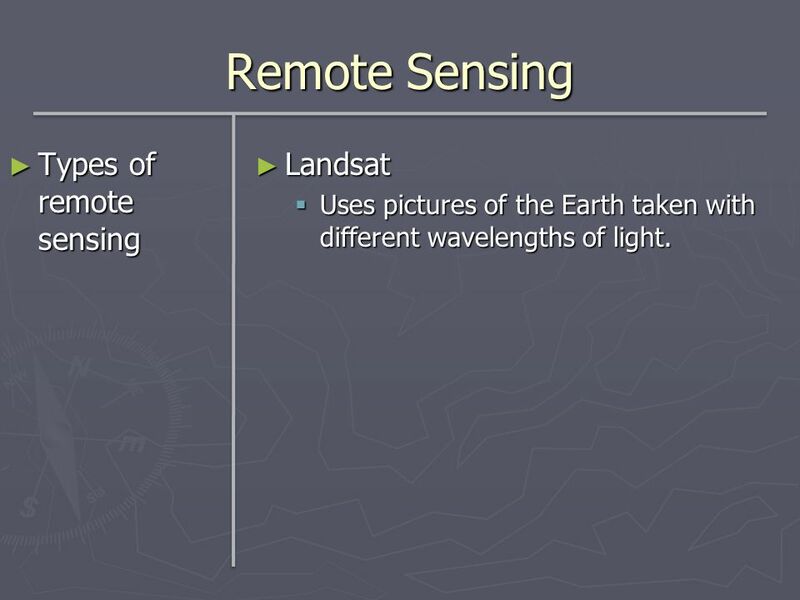 14 Remote Sensing What is remote sensing? 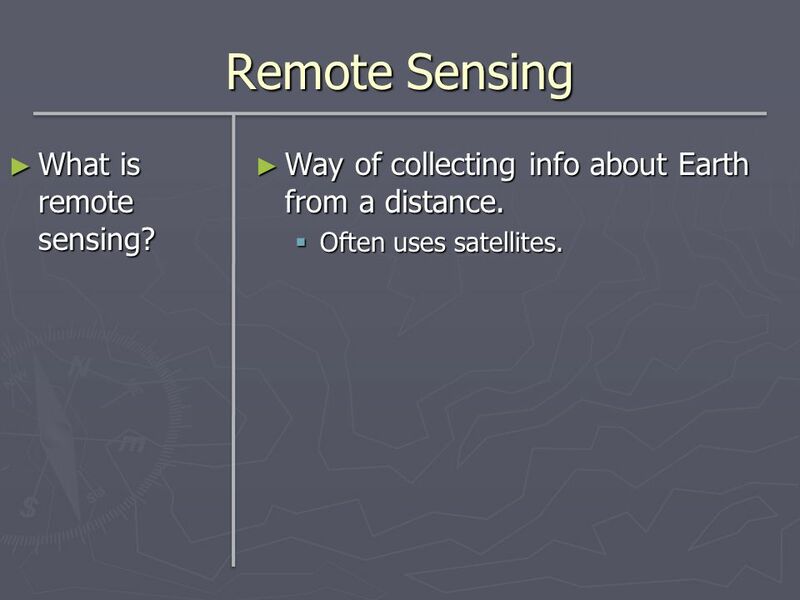 Way of collecting info about Earth from a distance. Often uses satellites. Uses pictures of the Earth taken with different wavelengths of light. 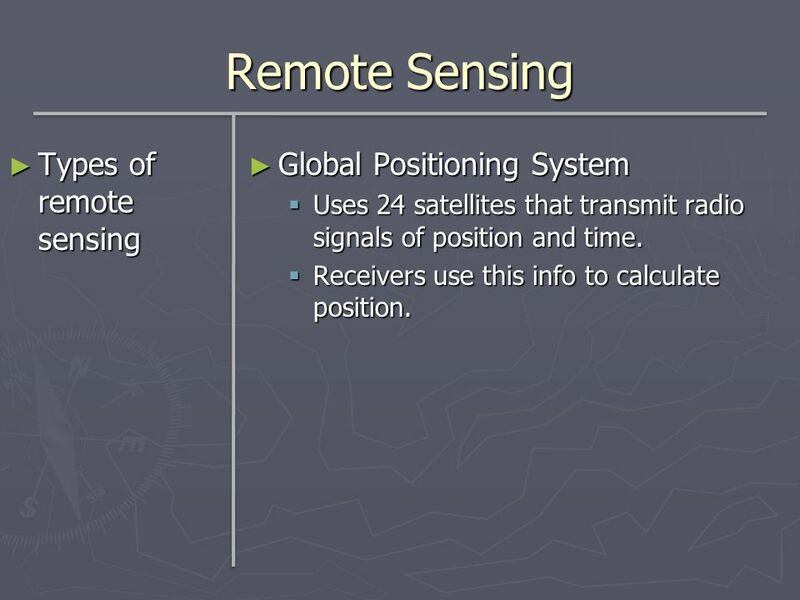 Uses 24 satellites that transmit radio signals of position and time. Receivers use this info to calculate position. 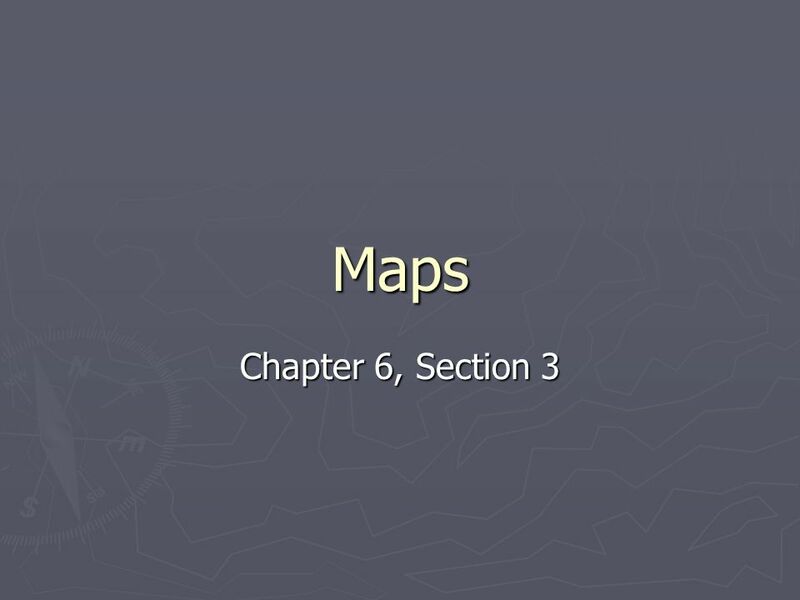 Download ppt "Maps Chapter 6, Section 3." How Can Objects on Earth be Located? Mapping Our World Goals: Differentiate between latitude and longitude. Objectives Vocabulary Compare and contrast different map projections. Modern technology has changed the way we view and map Earth. Ch.2: Mapping Our World Text ref. (pg.26). Warm Up 9/16 Earth’s major spheres are the ______. Ch- 7 Using Maps 1 K (What I know) W (Want to know) L (What I learned) Warm up- take out a piece of paper and do the “K” and the “W” for the above topic. 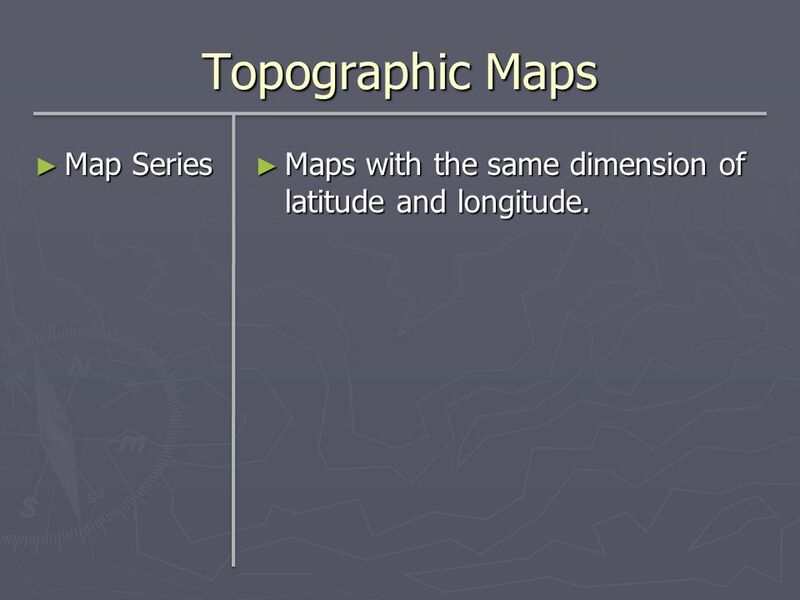 Essential Questions What are the different types of maps? Mapping Earth Chapter 1 Earth Science. Ch1 L.1 Maps How can a map help determine location? 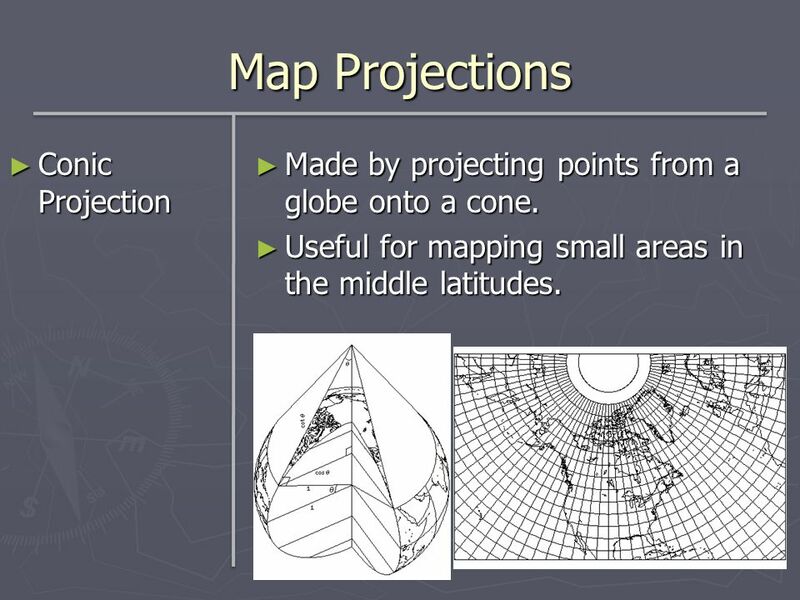 Why are there different map projections for representing Earth’s.